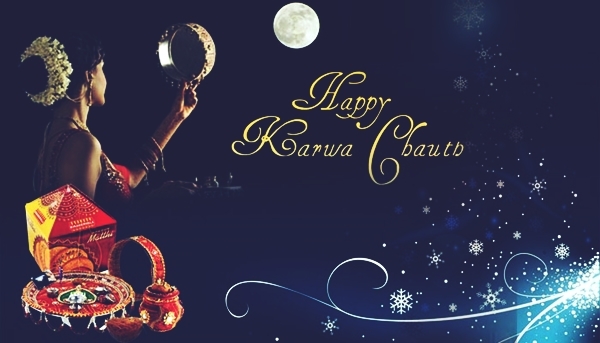 Happy Karwa Chauth Date in India 2019: Karwa chauth is an Indian festival that hails in the Hindu month of Kartika. This day falls on the immediate fourth day after the full moon or in the waxing moon fortnight in the month of Kartika. Women on this day observe fast right from sunrise till the time the moon rises in the sky. This day long fast is observed for the wellbeing and longitivity of husband’s life. The festival of Karwa chauth is majorly celebrated in the northern parts of India. In the states of Punjab, Haryana, Rajasthan, Himachal Pradesh and Madhya Pradesh Karwa chauth is celebrated with a zest. Karwa literally means earthen pot and chauth is the fourth day in the lunar cycle. A few days before Karwa chauth women buy earthen pots from the market and decorate it for the ceremony with paint and other material. Wheat is then sowed in these Karwas. This is done to pray for fuller and quality crop as Karwa chauth falls in the beginning of new crop cycle (Rabi crop cycle). This shows the linkage of the festival with agricultural cycle. Moreover, end of kharif crop cycle bring in money to the households causing them to celebrate. On the other hand the northern states of India have noticed a number of military invadations which cause a very high no of males for the local population participate in the army. So the women in the house hold would fast and pray for their husbands’ health, victory and long lives. Thus, we can conclude that the festival of Karwa chauth has its own importance to agricultural and non-agricultural households. The preparations for Karwa chauth begins a few days before the actual day. Women buy Karwas, shingar (cosmetics and other adornments) and other necessities. Markets in this period are flooded with all the requirements. The rituals though differ from state to state. In Punjab, women wake up in early hours of the day and get ready. Then they are supposed to drink and eat before sunrise. Sargi is sent by the mother-in-law which is supposed to be consumed as the predawn meal. Sargi is a kheer or porridge made up of fenia seeds. If the mother-in-law resides with fast observant she is supposed to cook for the daughter-in-law. On the other hand, in Uttar Pradesh the fast observant is supposed to eat soot feni with milk and sugar in it. The observant is supposed to eat it on the eve of Karwa chauth. Once the sun rises the celebrant can’t eat or drink anything till the moon rise. On the day of Karwa chauth women are supposed to rest and not work. Women folk together, apply henna, sing songs throughout the day. In the evening they get dressed up in festive cloths. In most of the parts the wedding dress is reworn for the ceremony. After getting ready women gather on the rooftop and perform the Pooja together. Post moon rise the moon is seen through a sieve and then the husband is seen the same way. Then the husband is supposed to offer his wife water signifying successful completion for her fast. Post rituals the women are allowed to eat and drink. There are many legend associated with Karwa chauth some come from long back in history. According to a legend there was a queen named Veeravati. Queen Veeravati had been married to a king. A few days after her marriage the king had to head on a military expedition hence, Veeravati had arrived to her father’s place. She was the only sister to her seven elder brothers and so was much loved. Veeravati’s first Karwa chauth arrived during her stay into her paternal home. Veeravati for her husband’s sake observed a strict fast. She desperately waited for the moonrise as she could not stand the rigor of the fast. Her brothers could not bear this and hence to relive their sister they paced a mirror over a huge peepal tree making it appear like a moon. Veeravati was over delighted see the moon. Supposing it to be the moon she ended her fast. Soon, the new of the king’s serious illness reached Veeravati. Veeravati hence, started off to meet her husband. On the way she met Lord Shiva and Goddess Parvati. Goddess Parvati informs her about the death of her husband. She also tells Veeravati that it was her breaking of fast after seeing the false moon that had caused her husband to die. On asking for solution on that situation Parvati asks her to observe the fast again and the king’s life would revive. Veeravati this time successfully completed her fast and the king came to life once again. Another legend comes from Mahabharata. It happened so that once Arjun had gone into deep penance into Nilgiris. Years passed but Arjun did not return. The rest of the pandavas had been facing problems in Arjun’s absence. At last, Draupadi their wife went to Krishna seeking for a solution. Krishna reminded her of Karwa chauth. Draupadi hided his instructions and followed it. She observed a strict fast and performed all the rituals. Consequently, in a few day times the problems faced by the pandavas were resolved and Arjun too came bake from his penance. Like Savatri a women named Karwa saved her husband’s life. Karwa was a pativrata which had brought her immense devotional power. Once her husband had gone to a nearby river to bath where he was caught by a crocodile. Karwa went to Yama and asked him to grant the crocodile hell. Yama could not deny her and granted the crocodile hell and hence, her husband’s life was saved. Karwa chauth can be thus observed as a romantic festival symbolizing love between husband and wife. Now day’s women observe fast, get together, sing songs and enjoy their day. It is also day of recreation for women from their daily routine. The festival of Karwa chauth has also been included in the Bollywood stories. This proves that Karwa chauth has become an intrinsic part of Indian household. With time the rituals and way of celebration might have changed a bit but the intention and feelings behind it remains the same.